Do you plan to invest in Eaglewood? If you do, now is probably not the right time. This week, the shares of Eaglewood Energy Inc. (CVE:EWD), (PINK:EWDYF) started to fall on the TSX Venture Exchange (CVE). They are doing it on rising volumes and on no major company developments. Actually, EWD has a very interesting performance this month. The stock has been bouncing up and down. 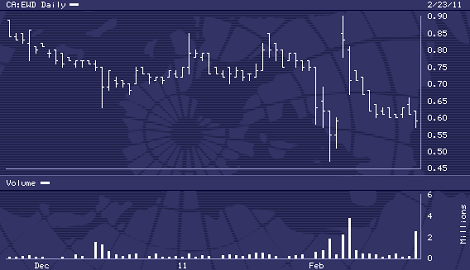 From a 52-week low of $0.47 on Feb. 3, to a 3-month high of $0.90 only several days later. During the last session, EWD lost 3.3% on a huge turnover beating 5.5 times the average. Eaglewood Energy Inc. is an international oil and gas exploration company with exploration licenses in Papua New Guinea. Currently, it has no production and relies primarily on equity financing to raise funds. Eaglewood might profit from the rising over the last months oil prices. They are jumping sharply worldwide, as violence and turmoil spread in Lybia. This could support the up move of the shares in the future. However, there are some not so positive facts, which could have a negative impact on the share price. The latest financial reports indicated that for the three months ended Sep. 30, 2010, Eaglewood incurred a net loss of $1.12M. Two days ago, the company lost a valuable man from its manager board. Mrs Arlene Weatherdon resigned as a Chief Financial Officer and relocated to Colombia. Probably, this has been evaluated as a negative development by some investors too. The good news is that Eaglewood is making efforts to improve its financial state and last December it raised $10.1M via a prospectus offering. This will certainly aid the company in the management of its numerous projects.